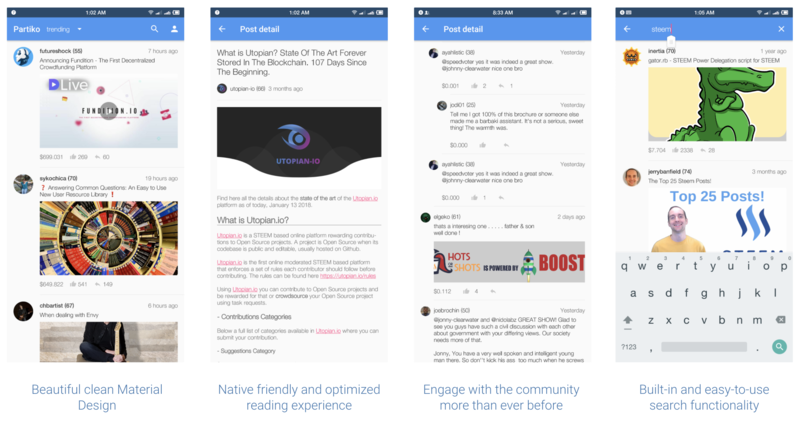 Today we’re pleased to announce Partiko, a beautiful Steem Android client we’ve been working on lately. We’re a group of people who are fascinated by how Steem is such a practical blockchain project at this moment, its unique nature of decentralization and censorship resistance, and its potential to reshape the human society. We have learned about Steem for a very long time and have mostly been reading the content rather than publishing articles. Over the past year the whole Steem community have taught us so much about cryptocurrency and decentralization in general, and we couldn’t be more thankful for that. We don’t own any Steems, and we don’t think that should stop us from participating the community in a more proactive way and helping make it better. Why building another Android client? A beautiful app deserves a beautiful name. We are really big fans of “p” words, they stand for potential, possibility and prosperity, which are exactly what we think Steem is. The word “partiko” is transformed from “particle”, which means “getting paid by writing article“. Please do not trust anyone who's sending you the app, the only source of truth is the announcement channel. When we send the app we'll also send you the hash so you can always verify by yourself. Since we’re at such an early stage, the source code won’t be available just yet. That being said, we deeply understand the power of open communities and will certainly open-source it for more contribution when the code is more ready. We hope you enjoy the app and let’s make Steem and the world a better place! Looks great - how did you guys come up with the name? I see a ton of ppl using this app lately. I was wondering how Partiko is monetized? If I connect my steem account, is Partiko charging some sort of transaction fee on my steem usage? This is going to turn everything upside down Sida! Can't wait for when more people hear about Partiko!!! Congratulations and thanks for sharing! Links to your post and profile were included in the Steem.center wiki page Steem Ecosystem: M-R. Thanks and good luck again! incredible post that is very useful for steemians around the world @partiko with work straight up to born partiko..name beautiful and I really like this, I hope you can support me for both of us work in this project. Would there be a chance for the posted on Partiko to be removed in the future or will it stay on? I like how the links are pink though. Haha. Me too! Love the picture man! Hi, I've downloaded it to my phone so I'm looking forward to trying it out. Thanks for the hard work.